KENNETT SQUARE, PA… Metalwërks® Ameriplate™ served as the basis of design for the new Hartford Hospital Bone & Joint Institute — a landmark facility in Hartford, CT. 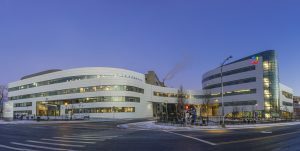 The Bone & Joint Institute is the centerpiece of a campus expansion at Hartford Hospital, including two new buildings connected by a curving bridge. Metalwërks’ Ameriplate wall system clads both buildings and the bridge, creating graceful flowing lines and allowing for design consistency — despite the fact that the two buildings have different styles of rain screen wall construction. The unique characteristics of the Ameriplate system, along with Metalwërks’ project design assistance, allowed the wall panel façade to appear seamless and flow from one building to the next. The Metalwërks sales team worked closely with Perkins + Will’s New York City office early in the schematic design and design development phases of the project to create custom details for the façade. This design assist process was particularly effective for coordinating the building envelope details. Together, Metalwërks, Lymo Construction, Gilbane, and Perkins + Will demonstrated an extremely high level of technical mastery over the challenging design relationships between the walls and the structure. Metalwërks produced 50,000 sq. ft. of curved, flat, and wedge-shaped wall panels in a 2-coat Bone White PVDF coating for the Bone & Joint Institute, and an additional 15,000 sq. ft. of panels for the adjacent Ambulatory Services Building. The end result is an intricate, undulating design across two building facades, with a floating panel effect that can only be achieved with the Ameriplate system. And this design is also a 2017 American Architecture Prize winner, taking home the Bronze for Architectural Design in the Healthcare category. “The buildings’ curvilinear design required precision in the exterior panels. Metalwërks solid aluminum plate adapts well to curves and remains smooth over the entire exterior surface, achieving the ideal expression of our design,” adds Goodwin. Ameriplate is a rain screen wall cladding system engineered to provide a “suspended in the air,” crisp, flat-plate appearance. The product is supplied from .125” to .250” thick solid aluminum plate. It is also available in mechanically polished or etched stainless steel in a variety of finishes. Its panel frame is engineered for a variety of orientations, including vertical, horizontal, curved, or trapezoidal-shaped panel surfaces — and even with perforated faceplates. The Hartford Bone & Joint Institute project was completed in late 2016. The project team included architects Perkins + Will, New York, NY and HDR, Inc., Omaha, NE; general contractor Gilbane Building Company, Providence, RI; and installer Lymo Construction Co., Inc., Merrimack, NH.